We were fascinated by the numbers of bees around some inconspicuous pretty, delicate blue flowers when we walked into the main clearing in Reffley Wood during the afternoon of April 17th. At first, we had taken them to be violets. They stood only two-and-three-quarter to three inches tall amongst the grass and formed a large patch, stretching out from under the trees into the open. Later, I checked in my wildflower book by Simon Harrap and they appeared to be ground ivy. When seen on the close-up photos, it is clear that the ivy flowers have a very long tube, which presumably means they are enjoyed by long-tongued bees, or cheeky ones which bite into the back of the flowers and steal their pollen. I tried to get some close-up pictures of the very busy bees visiting the flowers, but when I looked back at them, they were rather disappointing. Plus, there was only one I was fairly sure of – a red-tailed bee. What we thought on site was probably a buff or white-tailed bee clearly wasn’t as my photo shows it to have three yellow bands, whereas the aforementioned bumbles only have two! A red-tailed bee amongst the ground ivy. I think this is a common carder bee? This bee has a yellow band near the shoulder, another at the base of the thorax and one at the top of the abdomen. Similarly, I thought I’d captured a carder bee, but I wasn’t totally convinced when I saw the photo. However, after re-reading the information on a chart, which states that the abdomen of a carder bee can vary from quite light to dark, I think I did find a carder bee! I’m including the clearest of my photos here to give an idea of what we saw. I think I’ll send some to iSpot (the organisation set up by the Open University to help people identify everything from plants to mammals) for their volunteer experts to consider, too. One or two shots of a bee fly, which was also feeding from the ground ivy flowers, did come out clearly, I’m relieved to say! A ground ivy flower with its long tube. 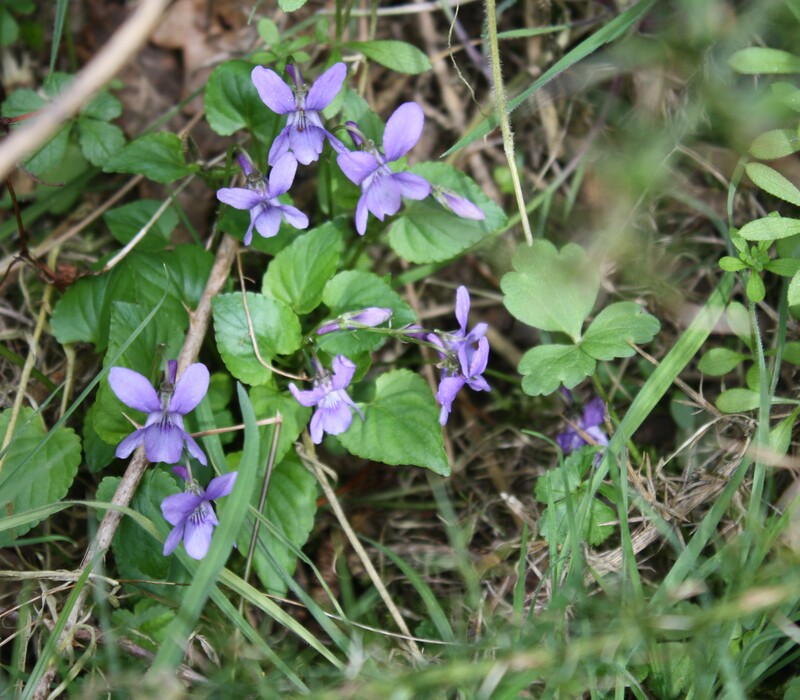 Dainty purple violets were growing along the edges of the main path and also in one of the clearings of the 130-acre ancient wood this year. I really like these attractive, diminutive flowers. Violets adorn the woodland ride. Dotted about a large part of the wood, which is owned by the Woodland Trust, were some primroses, another of my favourite spring flowers. The brighter, shinier yellow of lesser celandine also caught our eye in several places. It was noticeable that these cheery little plants seemed to have taken advantage of the areas where volunteers had recently been coppicing, thus allowing more light to get through the canopy. A burst of sunshine – the lesser celandine. I think it has been a particularly good season for spring flowers this year. A week earlier, I was delighted to see lesser celandine sprinkled in the lawns of some houses leading to Reffley Spring Wood, as well as a more plentiful display of them in the wood itself. They also brought a touch of colour to the grassy area between the Spring Wood and Temple Wood. The Friends of Reffley Spring Wood recently planted some cowslips in this area, so, hopefully, it will eventually become an attractive meadow if the mowing regime can be tailored to fit. 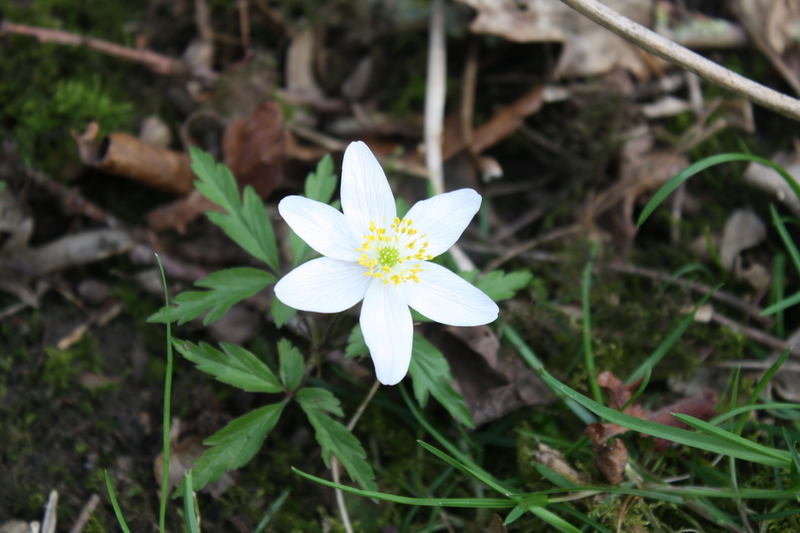 Again this year, I discovered some dainty white wood anemones in Reffley Spring Wood. And dog’s mercury was a common sight in Reffley Wood and Reffley Spring Wood. Wood anemone, primrose, dog’s mercury and certain types of violet are all indicators of ancient woodland (woodland established for at least 400 years). I also found lesser celandine growing near the hedge planted near the road. These wild flowers bring a smile to the spring days.